This review is going to be a combination of several trips. (1) Geographically, we are going to Latvia, one of the Baltic republics. (2) Historically, we are going back 800 years when pagan tribes of Latvia, Semigalls being one of them, resisted the best they could the advancement of the German Crusader knight orders, the Pope’s dogs who instilled Christianity in that part of the world with fire and sword. 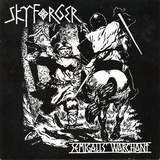 (3) Creatively, because Semigalls’ Warchant is a reissue, we are going to witness the evolution of one band, Skyforger, from its 1997 largely black metal demo to this 2005 re-release including the brand new Asinslauks EP, which is the primary testament to the aforementioned evolution. Even though Saullekts Par Sveto Mezu (Sunrise over the Sacred Forest) is drawing upon images of beautiful Latvian nature (I know, I have visited there), with its flute and bird chirping, you simply know this is not going to last. Not with the drums of doom creating an ominous feel, promising to turn this beauty into a place of bloody struggle. The promise is fulfilled with the rest of the demo delving into Scandinavian inspired black metal, with native Latvian folk elements sprinkled in spots. Guitars of the demo are blurry and distorted, howling as dark cold winds (the end of Night of the Winter Solstice). The bulk of the music moves between Darkthrone blast, albeit with much bigger tom hits, and early Enslaved and Bathory Viking riffs (Werewolves). Personally, I appreciate this more when the blurry rage is replaced with a steady rolling force a la early Einherjer, as in the opening melodic riffs of Virsaite Nameisis (Chief Nameisis), or more traditional metal headbanging rhythm of Night of the Winter Solstice. It is music like that which becomes much more receptive to the Latvian folk elements of Skyforger as well, the bagpipes and sleigh bells making so much sense in Night of the Winter Solstice. Compared to the rest of Peter’s almost artificially evil black metal croak vocals, which are Grutle Kjellson ten times over, Sen Dzirdeju, Nu Ieraugu (Long I Heard, Now I See) seems a welcome breather with its a capello folk choral singing (later on making appearance on Kauja pie Saules/The Battle of Saule), but almost feels out of place. The break is not to last long as the title track reminds us again that introspective Semigalls can be just as nasty and resolute when the battle starts, all the way to the final triumphant melody. That Sen Dzirdeju, Nu Ieraugu (Long I Heard, Now I See) sure felt wonderful though, with different voices taking the lead and foreign tongue creating a totally rustic feeling. We all should be glad Skyforger did not get stuck on the sound of Werewolves and Akmeni Iekaltas Zimes (Signs Carved in Stone). From the band worshipping Bathory and imitating early black metal, but very cognizant of their pagan heritage, the band has evolved into a truly pagan extreme metal band with their latest material. Asinslauks (Bloodshed) EP is not pure black metal anymore, nor was it intended to be, but who really cares. Much tighter musicianship, cleaner, but no less robust, recording, the EP also has its gnarly blasting battle title track, but even amidst Bloodshed Skyforger find room to go melodic, introducing some keys and folk instruments. Throughout the EP flute and bagpipe leads are organically woven into the flow, the band no longer needing to set the rest of their music aside to be folk. Uz Ziemelkrastu (To the Northern Shores) and Kavi, with its chanting chorus and almost power metal guitar solo, show previously uncompromising tribal fighters evolving into warrior minstrels. It is songs like that, which rightfully landed Skyforger a spot on the Heathen Crusade festival in Minnesota this year, will have In Extremo fans longing for the early days of the German troop, before wimpy gothic tendencies crept in. The vocals switch from the Enslaved croak to In Extremo shout is also quite fitting. Even the closer outro Saulriets Par Sveto Mezu (Sunset Over the Sacred Forest), completing the full circle with the demo intro, is more about peace than war with its emphasis on acoustics and no drums of doom. All by itself Asinslauks (Bloodshed) EP would have been a pagan metal gem, but due to the quote system I have to score it as a whole. However, Semigalls’ Warchant demo provides an insightful look of where Skyforger came from, and the band’s fans would appreciate the whole package as well. I have my hands now on their Perkonkalve/Thunderforge 2003 release and will be reporting on that at a later date.